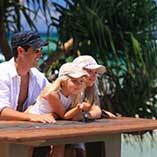 Book your Caloundra holiday apartment accommodation here. For the classic no holds barred Australian beach holiday Burgess @ Kings Beach will provide you with superb seaside accommodation. 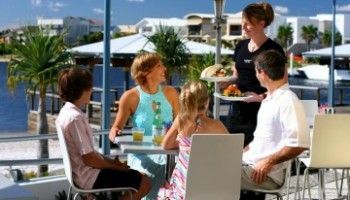 Why compromise on comfort or be isolated from civilisation when you can stay in the heart of Caloundra, the lovely seaside resort with everything you could possibly want from a Sunshine Coast holiday destination. 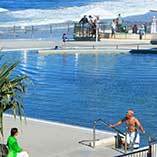 The beach, lovely public water pools, parks, restaurants and cafes, not to mention access to some of the Sunshine Coast’s best loved holiday destinations. 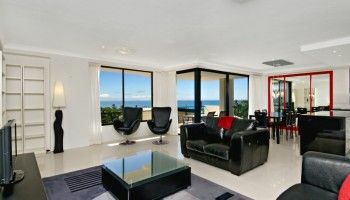 There is a lot to love about our large three bedroom Kings Beach holiday apartments. We have some two bedroom apartments too, but Burgess @ Kings Beach is famous for it’s hospitality and welcome to families and groups. Our fully self contained holiday apartments come with all mod cons, including a fully equipped kitchen and laundry (essential for families and longer stays) Foxtel, with most apartments above the fourth floor sporting superb views of the coastline up to Point Cartwright, or Pumicestone Passage and the Glasshouse Mountains. Kings Beach is the perfect place to stay if all you want to do is park the car and walk for the duration of your holidays. 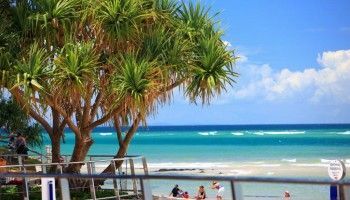 Caloundra has everything you need for provisions and entertainment and if you get bored with the beautifully sheltered Kings Beach, there are plenty of other beaches nearby. The coastline north of Kings Beach offers the kids plenty of rock pools to explore during low tide, and beyond there’s Shelley Beach, Moffat Beach and Dicky Beach around the corner if they get that far. Parental supervision is always recommended when kids are at the beach of course. Staying local, there are plenty of restaurant options to choose from that are within walking distance like De Lish Fish @ Kings. No prizes for guessing what they serve. The assortment of good restaurants nearby include Black Jasmine Thai Restaurant, Pappar’delles and Crusoes. There are also plenty of cafes at either end of the beach to try out as well, not to mention numerous delicious takeaways places for those lazy non cooking days. 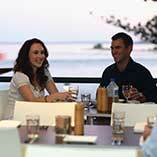 Book your Caloundra holiday apartment accommodation here at Burgess @ Kings Beach. For the best beach holiday.